Unwrap chocolates and insert cake pop stick into mini peanut butter cup, but not all the way through. Place a dab of frosting on the stick where it meets the chocolate. 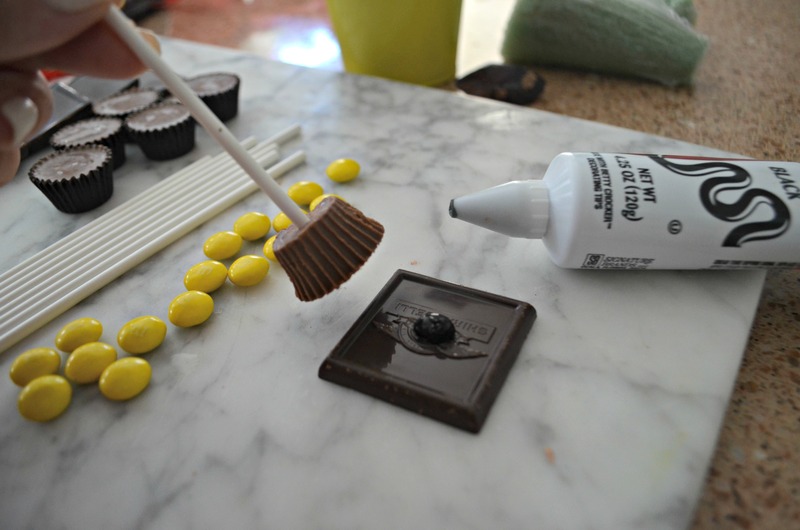 Use frosting to "glue" on the chocolate square. Insert treat into Styrofoam so it stands upright. 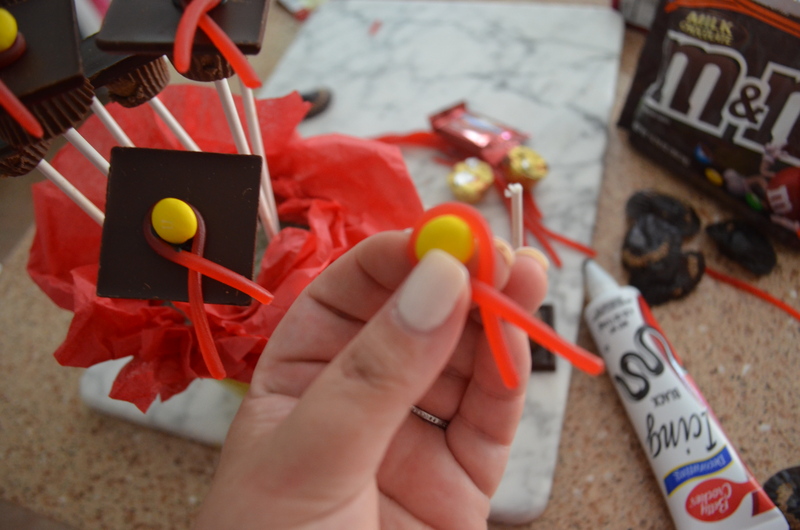 Glue on small piece of Twizzler with an M&M to the top of the treat as a tassel. Arrange in a small container with Styrofoam and tissue paper inside. Need a fun graduation party treat? 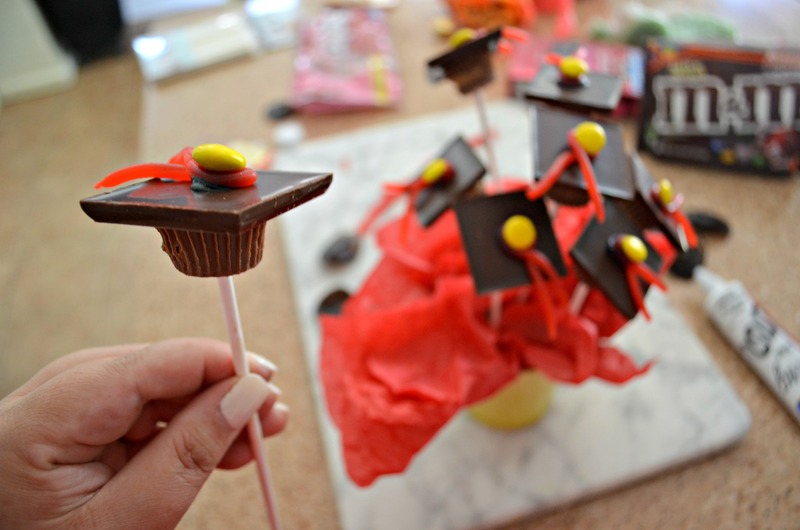 Consider putting together these ADORABLE graduation cap treats! They’re super easy to make and are a festive and yummy treat for your graduate. You can serve these cute caps on a stick or use them as fun graduation cupcake toppers instead. I used chocolate squares for the hats and Twizzlers make a fun tassel. There are different options for candy, so feel free to switch up ingredients if desired. It was a fairly quick project to do and something the kids can easily help out with! I used a store-bought bottle of icing that hardens when dried, and it worked very well. I’d use that instead of a softer frosting. Starting with very cold chocolate is helpful. I started with room temp and quickly noticed some melting while putting these together. Make a graduation cap bouquet! As an easy arrangement idea, I placed my treats inside a small dollar store bucket with some Styrofoam and colored tissue paper inside. 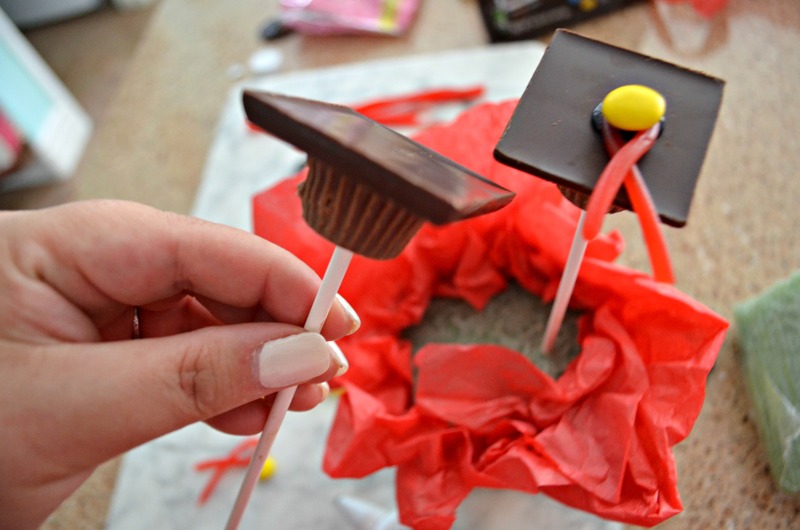 These mini graduation caps are adorable and make for some tasty party treats! These graduation treats are so CUTE! Cute idea! Since the chocolate squares can get expensive, I’ve used chocolate covered graham crackers. I think Keebler used to sell them and still might! Oh good idea! or maybe a square cookie. Oooh. I like that idea. Thanks for sharing! What can you substitute for reese’s? Peanut allergy. How about skittles? They come in lots of colors, so you could probably find your school color. Are they peanut free? Wonder if a round chocolate like Lindt would work for “head”. Put little dots for eyes? Are there any solid ones or are they all filled. Oh that’s so nice of you! I love this!! The BEST idea yet!! Super duper cute! Thxs. I’m saving this for next year as my son will be graduating.😢 Time moves too fast – cherish it! How long do I cut the twizzler piece?